Listening to music becomes a sensory experience in the new Audi A8. The Bang & Olufsen Advanced Sound System now also brings the unique acoustic character of pure 3D sound to the rear seats. The brand with the four rings thus offers first-rate sound quality in the top segment. Luxury is audible. The new generation of the Audi A8 demonstrates this in impressive style – with the Bang & Olufsen 3D Advanced Sound System. It supplies 23 loudspeakers featuring ultra-light and therefore low-distortion neodymium magnets that produce an airy, high-resolution sound pattern. The effect is impressive, especially when reproducing a classical concert of high recording quality: The interior is transformed into a broad stage where the music unfolds exactly how it was recorded in the concert hall – without any artificial effects. The sound is authentic and emotional. That is the top priority of Audi’s audio specialists, making sound quality a fitting reflection of the brand philosophy. The brand with the four rings first introduced 3D sound in the Audi Q7 in 2015. In the new A8 it now extends the evolutionary version to include the rear compartment of the car. Two full-range loudspeakers in the A-pillars and two in the headlining above the rear seats supply the spatial dimension of height and develop the surround sound into the perfect stereophonic experience. The 1,920-watt amplifier by Bang & Olufsen, which operates highly efficiently thanks to ICEpower technology, generates the 3D sound with its digital signal processor. It produces little waste heat and therefore abundant audio output – as is audibly evidenced in the detailed sound pattern. Above all, it amplifies the signal of the woofers, which reproduce sound that is especially energy-laden, such as a low note from an organ. When the infotainment system is switched on, the two tweeters extend electrically out of the instrument panel. Thanks to Acoustic Lens Technology from Bang & Olufsen, they ensure that the sound is distributed in a horizontal 180-degree fan. Individual amplifier channels supply each loudspeaker. 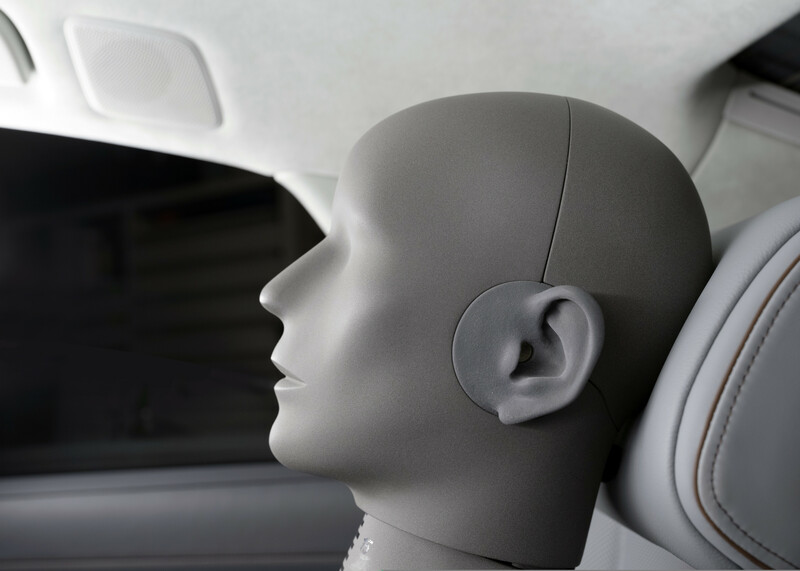 To produce the 3D sound, the new sound system draws on an algorithm that Audi has developed in partnership with the Fraunhofer Institute in Erlangen. It uses stereo or 5.1 recordings to calculate the information for the third dimension and processes it for the four 3D loudspeakers. This occurs dynamically; in other words, the algorithm adapts individually to the recording to avoid causing any distortion to the sound. Using the MMI system as well as a separate operating unit for the rear passengers that resembles a smartphone, the sound setting can be optimized as preferred – with a specific focus on the front or rear seats, or all seats. The rear-focused setting enables the rear passengers to enjoy the best possible quality of 3D and surround sound. As well as treble and bass, the occupants can also adjust the subwoofer volume independently of all other loudspeakers. Then there is a special function for film sound tracks, known as Movie Set. The 5.1 sound track plays in the same quality as in front of a big screen in the cinema. The system localizes every voice individually and adjusts the balance accordingly. For instance, if a character appears to the right of the picture, their voice is also played from the right. Work on the concept for the sound systems for the new Audi A8 started very early on in the development process. “Integrating the loudspeakers at the right points in the car is the key to 80 percent of the audio quality,” explains Wolfram Jähn, sound/acoustics developer for the A8. “They need to be mounted as rigidly as possible, so we fixed the subwoofer in the rear panel, which is made from carbon fiber-reinforced polymer. The aim is to isolate the loudspeaker from the body and prevent any vibrations from being transmitted.” The speaker grilles are another vital factor. For these components, Audi’s designers and sound engineers worked closely with the developers from Bang & Olufsen. The grilles need to have maximum acoustic transparency while also performing their protective function. It is all about striking the right balance between open and closed surface. In the Audi A8, precision-perforated covers of double-anodized aluminum adorn the loudspeakers in the front and rear doors. White LED light guides illuminate the woofers. The basis for top-quality sound systems is the quality of every individual component. High-end sound is an Audi core competence. Its collaboration with Bang & Olufsen began at the turn of the millennium. From 2005, the A8 was available optionally with the Advanced Sound System by the Danish specialist. This meant Audi was the first carmaker to be able to supply a factory-fitted high-end sound system. 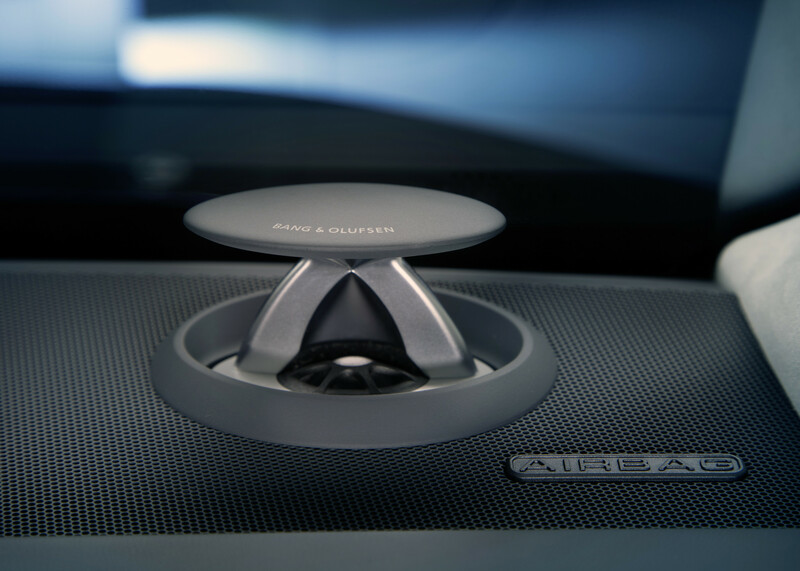 In the new Audi A8, Bang & Olufsen now supplies both the Advanced and the Premium Sound System. When the door is opened, a hearty audio jingle composed specially for the A8 greets passengers. Meanwhile the ambient lighting presents the interior of the luxury sedan in unique style.